I am so excited about today’s tutorial because this Triple French Braid Double Waterfall braid is one of my absolute favorites. I know it looks super tricky but I promise you it is not as difficult as it looks. A few years ago, I featured this braid as an updo and wanted to revamp it into a new style that would be fresh and fun for the new year. Since half up mini buns are so trendy I thought this version would be perfect for updating your everyday mini bun. I hope you love it as much as I do! Be sure to share it with a friend who would love it too! Step 1 / Begin by dividing off the top section of hair from the hairline back to the crown. Clip down the hair on the left and right side to keep it separated. Step 2 / Pick up a small section of hair in the middle section and divide it into three sections. Step 3 / Begin a regular braid crossing the right strand over the middle and then the left strand over the middle. Step 4 / Now begin creating a waterfall braid on both sides by first dropping down the right strand and picking up a new section in its place, crossing it over the middle. Step 5 / Then drop down the left strand, picking up a new section of hair crossing it over the middle in place of the dropped piece. Step 6 / Continue the braid, creating waterfall sections on both sides and braiding the entire middle section back to the crown of the head. Step 7 / When the braid reaches the crown, create a few more stitches of a regular braid. Then criss cross two bobby pins over the end of the braid so it doesn’t unravel. Step 8 / Next create french braids on both sides of the middle braid so start by picking up a section of hair on the left side and dividing it into three sections. Step 9 / Begin a regular braid crossing the right strand over the middle and then the left. Step 10 / Then start incorporating the waterfall pieces into the braid without adding in any new hair to the bottom side of the braid. Step 11 / When the last waterfall piece is brought into the braid, braid the section a little further down and criss-cross two bobby pins over the end. Step 12 / Now create a second french braid incorporating the waterfall pieces into the braid and working upwards at a diagonal towards the end of the first, middle braid. Step 13 / When all three braids are done, wrap an elastic band around the ends and remove the bobby pins. Step 14 / Tie the ponytail into a mini bun by wrapping a second elastic band half way over the ponytail. Then twist the elastic band with the left hand and grip the bun with the same hand. Wrap the ends of the hair around the front of the bun with the left hand and wrap the elastic band once more over the bun. Step 15 / Pull on the edges to make the bun a little bigger and then combine the ends and loop them back towards the bun, tucking them into the elastic band. How do you prevent a lot of breakage braiding your hair? I absolutely love all your braids but I’m getting a lot of breakage. I’m going to try your suggestion with the spray. Hi Missy! I always try braiding my hair but fail every time because of my hair’s texture. It gets really frizzy every time I brush it and makes it impossible to do. How can I fix this? Thank you for the advice in using a spray since it worked beautifully. I love it. 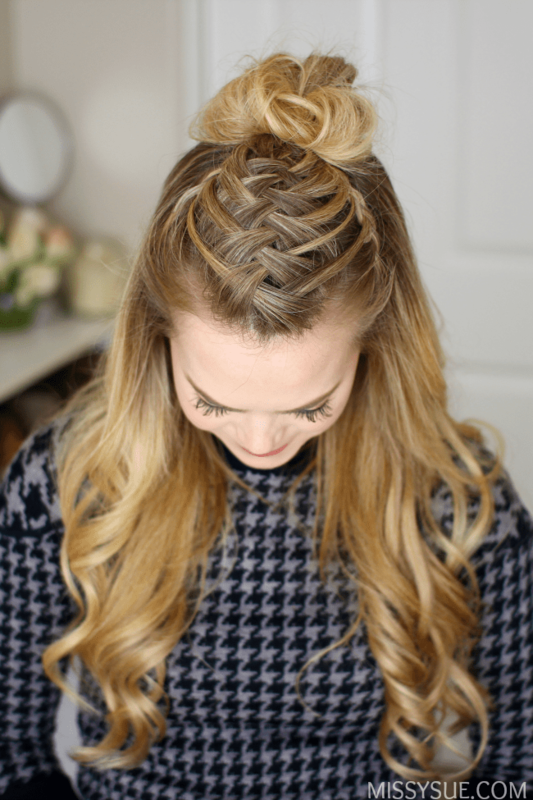 The triple french braid double waterfall mini bun is just amazing. Thank you for this intriguing hairdo idea, I think this will be my look for tomorrow :D :D.
I love your tutorials but I just an soo bad at doing my own hair.😂😂 do you have any tips for getting better at branding on yourself?